As Pennsylvania-based anti-fracking group Community Environmental Legal Defense Fund (CELDF) announces its hope of placing a so-called Community Bill of Rights measure on the ballot in Youngstown for a seventh time, a new EID report shows that the City of Youngstown has already spent $187,219 to put the measure on the ballot thus far. All six previous “Community Bill of Rights” ballot measures have failed. Freedom of Information Act (FOIA) requests and documents from the City of Youngstown and Mahoning County Board of Elections confirm that the city has paid $19,219.55 advertising the six previous ballot measures. 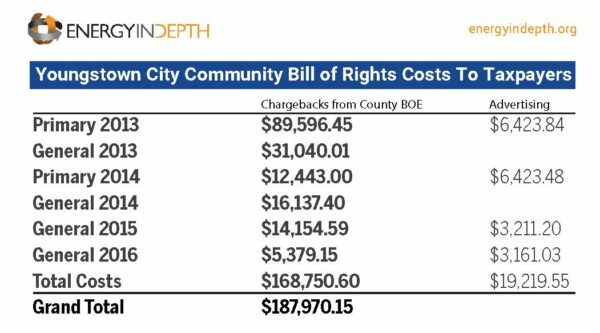 Each time the so-called Community Bill of Rights is placed on the ballot, the City of Youngstown pays approximately $6,000 in required advertising costs. The Mahoning County Board of elections has confirmed that $168,000 has also been paid by the City of Youngstown to print the ballots, additional advertising, ballot space, poll workers, and notes there are additional funds that have been paid to staff to count the votes. This week, fringe environmental activist group Frack Free Mahoning Valley — which works in concert with CELDF — announced it has delivered petitions to have the measure placed on the ballot again to the City of Youngstown, and this year that group changed the name of the so-called Community Bill of Rights to the “2017 Youngstown Drinking Water Protection Bill of Rights” in an attempt to mislead voters. The Mahoning County Board of Elections must now verify the signatures to allow the measure on the November ballot. For ballot measures that have taken place in odd years, such as the proposal for 2017, projections for the cost to taxpayers could be has high as an additional $36,000, which is nearly equivalent to a year’s salary for an employee in the City of Youngstown. Notably, the Ohio General Assembly last year passed House Bill 463, which is bipartisan legislation that includes a provision that “requires a board of elections or the Secretary of State to invalidate a local initiative petition if the board or Secretary determines that the petition or any portion of it does not fall within the scope of the local government’s constitutional authority to enact ordinances, or does not satisfy the statutory prerequisites to place the issue on the ballot.” Therefore, any so-called “Bill of Rights” charter proposals that run counter to state law could in fact be challenged and ruled invalid. Both Medina County and Athens County Board of Elections recently voted to keep measures similar to the City of Youngstown charter off the ballot, and both boards’ votes were swiftly upheld by the courts. Ohio courts, including the Ohio Supreme Court, have ruled on local control issues on numerous occasions regarding various industries over the years, and in each instance have determined that the state of Ohio has primacy over local governments in regulating issues and businesses that are of statewide interest and concern. The provisions found in H.B. 463 allow for legal rejection of charter amendment petitions, such as the seventh attempt by the Community Environmental Legal Defense Fund. As reported by EID, the six consecutive ballot measures have already cost the City of Youngstown over $185,000. Further frivolous misuse of taxpayer funds would be an outrage.